Test drive our products' graphical user interface and our network management software by clicking on the pictures below. These are real products, not simulations. Depending on your download speed, there will be some delay between when you enter the login information and when the product web interface is displayed. To view the web interface of the EAGLE20, you must accept an untrusted connection. Most of the devices use Java for the WEB-Interface. Java comes with own security settings which depend on used Java version. If you face any problem while opening a WEB-Interface please use the latest HiView version. Just type the IP-address of a device in the bottom line of the HiView window to open the WEB-Interface. As an alternative you can use this file to load these devices into HiView. Please note that HiView comes with an own and secure Java portion which can be used only for Hirschmann products. Compact, managed OpenRail switches assure innovative redundancy solutions. As well as the possibility of network supervision for the highest availability of complex solutions in process and traffic automation. RSP switches offer eleven ports, three of which can be equipped with SFP transceivers that support Fast (100 BASE-FX) or – optionally – Gigabit-Ethernet (100/1000 BASE-FX). The remaining ports can be used either for 100 BASE-TX or as a combination of four SFP transceivers and four TX ports. These switches are also remarkable for their extensive management and redundancy methods, as well as enhanced security mechanisms. In addition is a version available that supports precise synchronization compliant with IEEE 1588v2, plus PRP (Parallel Redundancy Protocol) and HSR* (High-availability Seamless Redundancy). 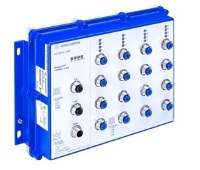 IP67/54 switches from the OCTOPUS family allow fail-safe networks to be installed in a variety of different application scenarios even under the most difficult conditions and covering the full range of automation solutions, such as rail vehicles. MACH100 switches are designed primarily for the control room environment and the verge of the office world. They offer an operating temperature from 0 °C bis 50 °C at fanless cooling as well as low initial investment, high quality and durability. 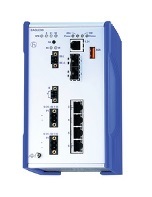 There are switches available with a fixed port number or as an modular workgroup switches. The possible option of SFP modules increases the flexibility to cope with changes in the network in the most efficient way. The rugged Hirschmann substation (IEC 61850) switches for Fast-ETHERNET applications deliver excellent performance and high port density in a compact form factor. The MACH backbone switch is real all-rounder (Layer 2 or layer 3 switch) and suits all applications - especially large networks, with a big number of media modules, high port density and the extendable routing functionality. 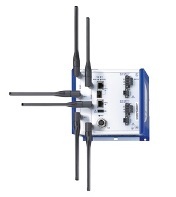 Rugged wireless LAN access point and/or client for use in industrial environments. Robust metal housing for mounting on DIN rails. As security router it provides local support for the full range of control applications. Extensive Layer 2 and Layer 3 redundancy features, combined with other highlights such as NAT and firewall, not only guarantee maximum data security but also make it easy to integrate your production facilities into the network. 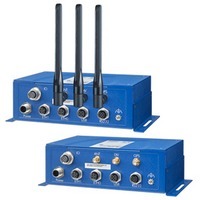 A single box solution designed for wireless mobile network communication that makes use of LTE, HSPA+, UMTS, EDGE or GPRS technologies. To view the product interfaces, JRE 7.0 or later must be installed on your PC. If necessary, you can download Java from http://www.java.com. If you cannot view the product interfaces, your firewall may be blocking SNMP (port 161).